July 21, 2014 bcalvanocoachingLeave a Comment on Weekly Angel Oracle Card Reading for July 21 through 27. Weekly Angel Oracle Card Reading for July 21 through 27. This weekend on Sunday July 27, I will be at the Psychic Fair NYC Hotel Pennsylvania in New York City channeling angel card readings. These are 15 and 30 minutes sessions. For more information see http://www.Awakenfair.com. You can pre book your sessions and receive a discount. Along with many other gifted intuitive readers and crystal vendors it looks to be a wonderful event! Also, join me this Wednesday live on BlogTalkRadio or rebroadcast at 1pm EST http://www.blogtalkradio.com/letsasktheangels where you can receive a free mini reading! This week I am guided again to use the Archangel Michael Oracle Cards deck by Doreen Virtue. 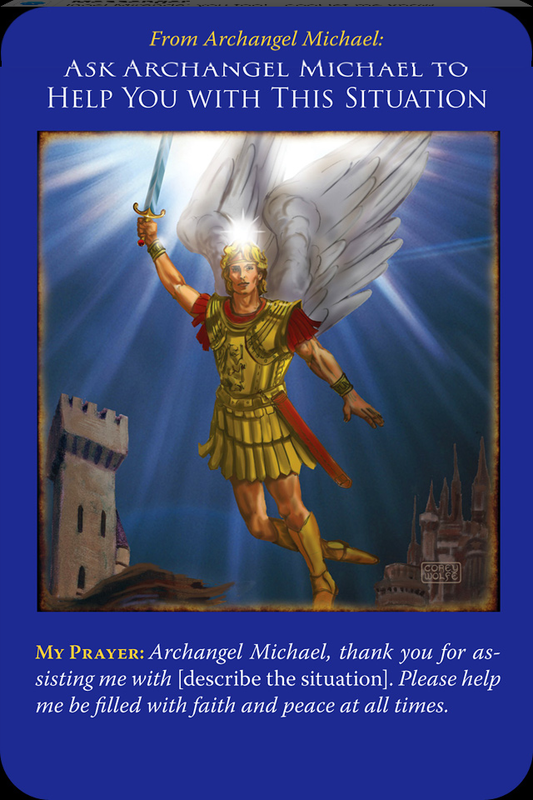 Archangel Michael is letting us know that we have indeed been given messages and guidance and to trust it! Through our thoughts, feelings and even physical signs – our prayers have been answered! Now is the time to trust ourselves, our intuition and move forward without hesitation or delay in matters that are near and dear to us. Our ego or fear can constantly battle with us having us hesitate and second guess what is right for us. Archangel Michael reminds us we are indeed in touch with our inner self and to go ahead step forward into our power with courage, confidence, and strength. 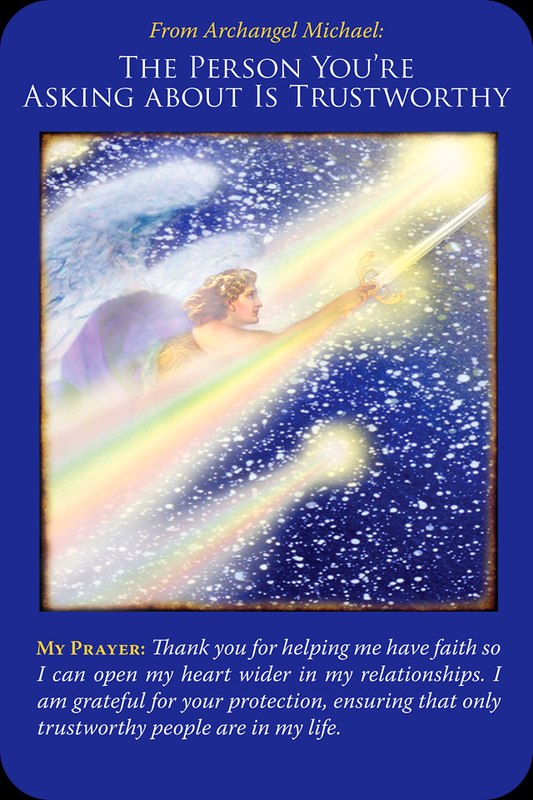 For Wednesday : “ Ask Archangel Michael to Help You with This Situation”: “Archangel Michael, thank you for assisting me with (describe the situation). Please help me be filled with faith and peace at all times.” Asking for help is the continued message. We can receive guidance and begin taking actions, then be stopped by fear. We are only human! Archangel Michael speaks about allowing ourselves to be filled with faith and peace at ALL TIMES! How is this possible? By working in tandem with Archangel Michael and the angels. Keep them close by your side so that you can be seamless in your actions this week. Even better, ask Archangel Michael to be by your side at all times and at night before you fall asleep, ask him to enter your dreams to assist you even more! Healing and solutions will occur while you are resting and you will awake with more ideas and energy for your life! His presence reminds us that we are not victims but powerful human beings! Here we are asked to let go of any blaming and unforgiveness of others. Also, that people are not perfect and allow this person to be human. They can be trustworthy and dependable. It’s easy to close our hearts and not really open ourselves up to all the new people to enter. Archangel Michael assists in opening our hearts wider and allowing in new people and to even deepen our present relationships. We are also reminded that you can pray to have only trustworthy, kind and gentle people enter your life! You can actually have a drama free and peaceful life! This message is not about inviting fear. It’s more about becoming responsible for our power and sensitivity. As we open ourselves up this week we are reminded to shield ourselves. We are extra sensitive to energies right now and it is important to avoid situations where anger and or competition are expressed. Stay away from places and situations where chemicals are abused such as bars and some clubs, which can attract lower energies. Pay attention and follow your intuition as to who to spend time with. Shielding is similar to using an umbrella to protect us from the rain. We call upon Archangel Michael and his purple (royal blue) light. We ask that this light surround us like a bubble from the top of our head to the bottom of our feet. This shield lasts for about 12 hours and needs to be invoked again at the end of the day. It will protect you from absorbing others lower energies. You can also wear or carry a black obsidian crystal. This week Archangel Michael powerfully let’s us know we can absolutely trust our inner guidance, ask when needed to be filled with faith and peace at all times, open our hearts even wider to those around us who may have disappointed us in the past and shield ourselves as a practice to stay in grace and ease. 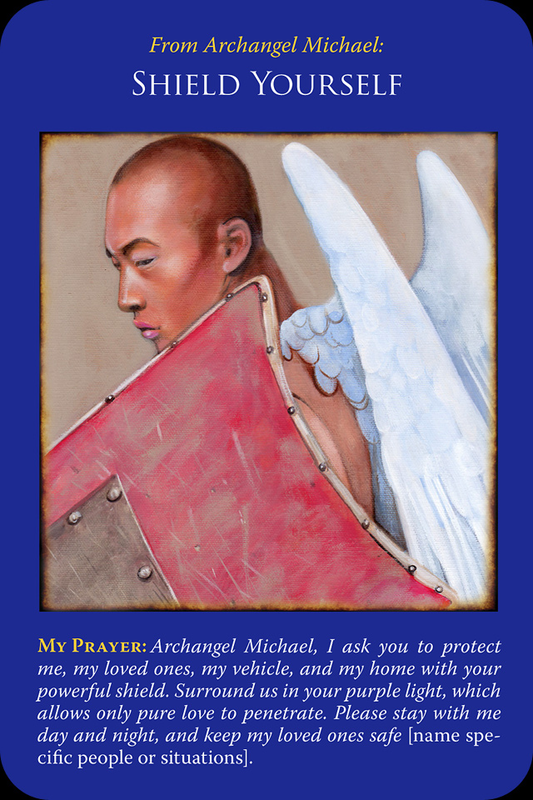 Archangel Michael is always available to assist us, stay with us and protect us. All we have to do is be willing to ask! The more you work with Archangel Michael the easier it gets! Have a blessed week! Join me live on my radio show Wednesdays at 1pm EST or rebroadcast at Itunes at http://www.Blogtalkradio.com/letsasktheangels. Follow me there to get updates on shows. Next Weekly Angel Oracle Card Reading for July 28 through August 3.